You can have your officetel – Hello Korea ! 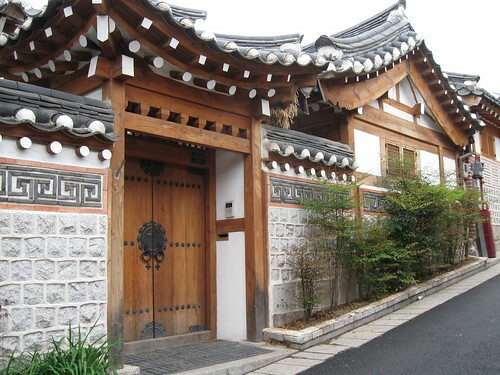 Once upon a time, most everyone in Korea lived in hanoks. 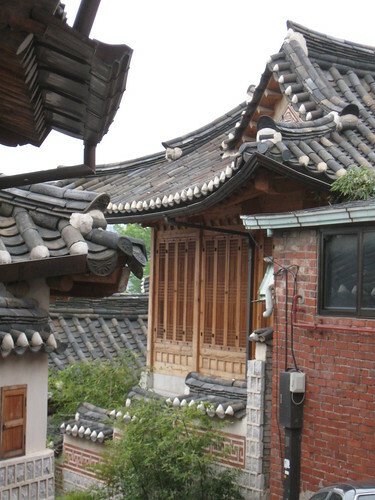 There is an entire hillside village in Bukchon of extant hanoks, still privately occupied, which I walked around and photographed. One grandma was opening her door and I got to peek inside for a second, and let me just tell you, the courtyard was absolutely gorgeous. I’ve no doubt that this is old money who own these hanoks, and I would call them estates even though they are not that big. A lot of imported cars like BMW’s in the drive-ways, so you have probably got to be well-heeled to own one of these, and it’s probably been in your family forever. 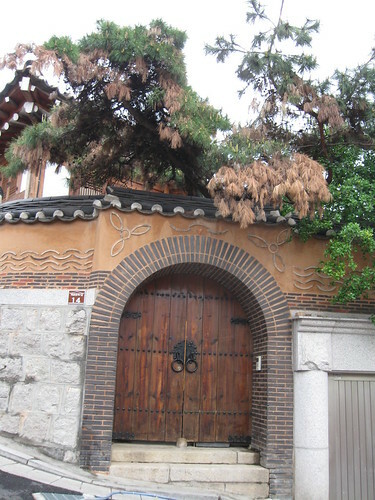 I read that some of the hanoks in Seoul had to be re-built in the 30’s because the Japanese occupation partially destroying some of them. What’s interesting also is that many of them sit atop modern garages, so they must have been shored up and the garages excavated under them. 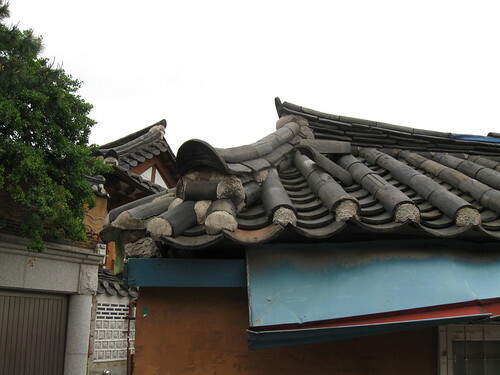 All around Seoul, here and there, you can spot the tiled roof of some hanok in total disrepair, squeezed in between and behind some run down commercial establishment, for example. These aren’t long for this world, I am sure. I took a million photographs of these up-scale hanoks, but here are a few select photos for you. These places are like impenetrable fortresses! Many of them had a short door off of the entry steps like this one – I was wondering if this was the location of the original latrine, and maybe it drained onto the street or into a sewage gutter at one time. 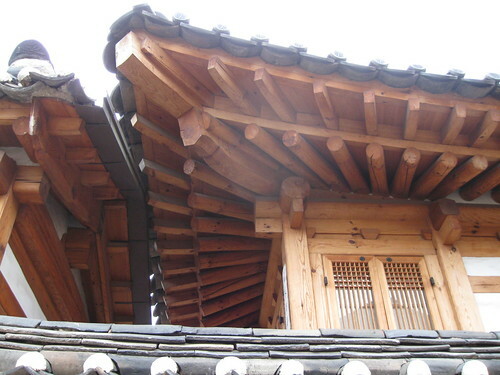 As you can see, there are sooo many textures in Korean architecture. 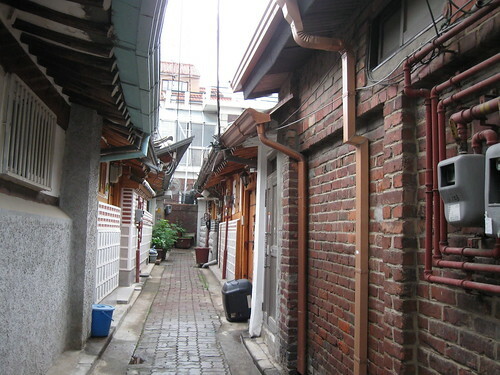 I was really surprised when I first got to Korea, how much brick there was. And stone. I had been expecting all modern materials or something less muscular. But it’s all about rock, earth, and heavy timber here. I kind of like it…It’s not as dainty and refined as Japanese architecture, which is more about all wood frame construction. Would take some study to discern the guiding principles and compare. Note how the stone of the old walls has been cut into modular pieces. They do not have their mortar pointed, but it extrudes out. And yet they took the time to flatten the extruded mortar all on the same plane, so it looks like a frame. This looks to be a restored roof: I took this shot so you can see the huge amount of build-up to the roof structure. 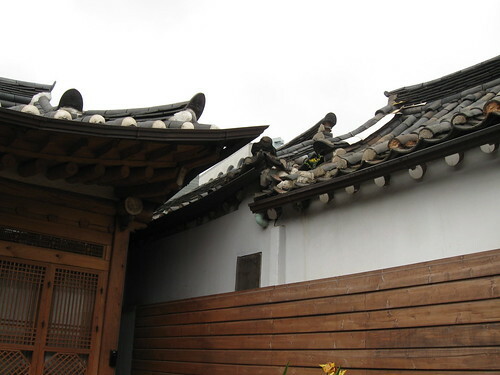 What looks to be white painted timbers in many of the photographs, sticking out from the roof tiles, is actually extruded mortar. This less refined example clearly shows that. Also note how large and how far the metal gutter system extends. On more prime examples, the corners where gutters intersect are fashioned into lovely points, making the entire heavy roof system more poetic and lighter. One lower elevation hanok was open for visitors, but the interior was being remodeled and closed (of course) so I only could get as far as the courtyard. 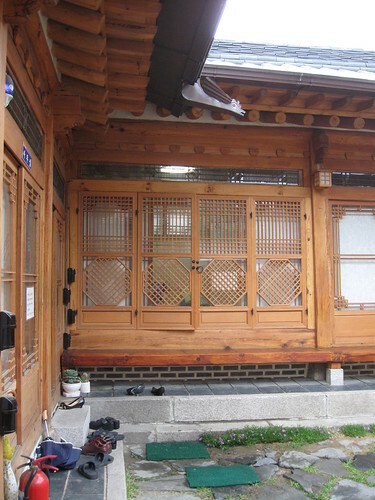 From there, you can see at the top the metal whimsical downspout, and at the bottom, you can see how the ondol floor heating system is still intact here. 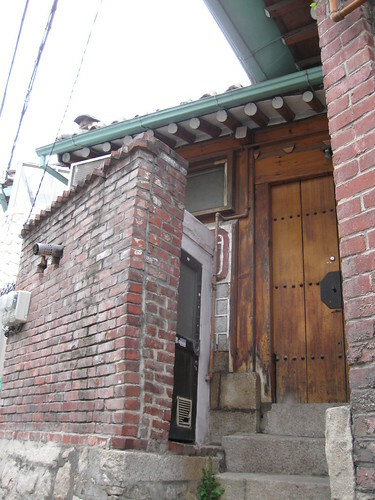 (note the bricked-in portion beneath the floor level) For those of you who don’t know, Koreans used their crawl space as a horizontal chimney, which radiated the heat from the cooking fire across the length of the floor. This provided maximum fuel efficiency and comfort during the long winters, and the heating coals also provided an always ready source of heat for cooking soup, stews, and steaming rice. This is why Koreans sleep on the floor, and why they throw water on the floors to humidify the stuffy winter rooms. 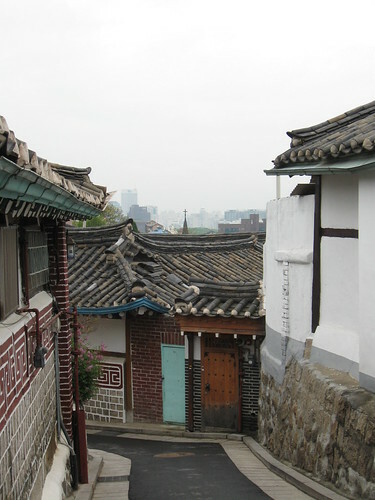 There were also some lower class hanok still extant at a lower elevation, and here is what the entrance alley to those hanok looked like. Pretty charming and cozy. I wanna live there! Not in one of the fancy schmancy ones on the hill, owned by the Yanban (scholarly elite) but something simple like these. 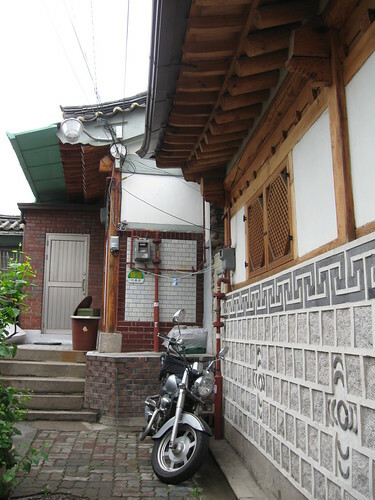 Just add me to this picture: A hanok, a motorcycle, and me.